It's October, so there's really no surprise that we're seeing a lot of horror collectibles right now. What is a bit surprising is how many relate back to the Universal Monsters. Clearly, they truly are classics with enduring designs and concepts. 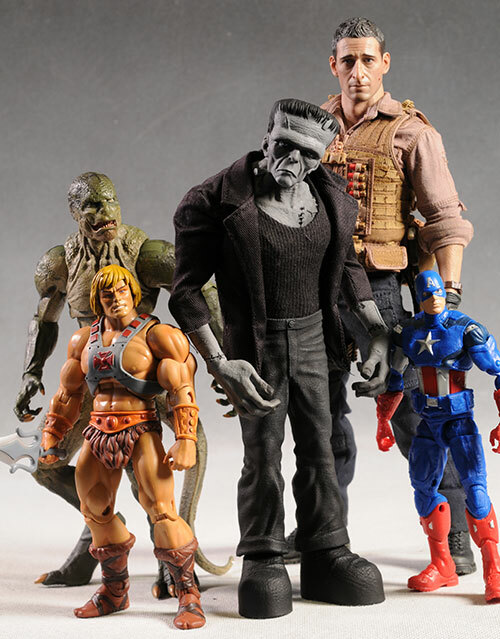 Mezco, creators of many cool figures over the years, picked up the license awhile back, and are just starting to treat us to the initial offerings. 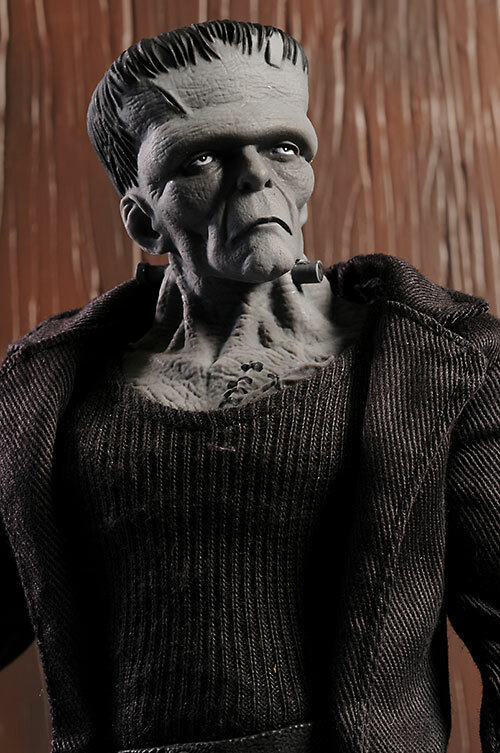 At last summer's San Diego Comic-Con, Mezco showed off several 9" scale figures, including Frankenstein's Monster, the Creature from the Black Lagoon, and the Mummy. So far, we've only gotten tonight's review - Frankenstein's Monster. There's actually two versions of this guy already out. There's the normal color version, which you can pick up at a number of retailers, including those in the Where to Buy section, at around $28. Then there's the subject of tonight's critique - the black and white New York Comic-Con exclusive. They only produced 100 of these figures, and sold them for $50 each. As you can imagine, they didn't last too long. That means your best bet right now for the monochromatic variant is ebay, where there's 3 or 4 currently listed for around $100 each. The figure comes in a nifty box, with a nice, large display window. He sits inside a plastic tray, and there's a few twisties. Thankfully, they aren't tough to remove, however, since they are thick and not too tightly twisted. The package is also collector friendly, with no need to damage anything in removing Frankie. 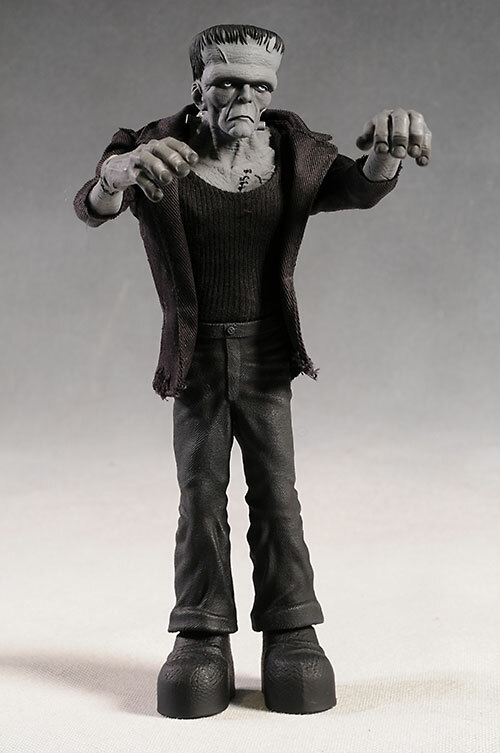 Mezco has always had their own stylized design, something that appeals to some, and not to others. For me, this somewhat caricaturized style works better with some characters than with others. I don't know exactly what it is about the Monster, but I really like it here. The head sculpt is amazing, and the detail work on the scars, skin and hands is great. While this isn't a pure Karloff portrait, I have to say that I see him buried in there. I love the sleepy lids, down turned mouth, and textured skin - in person, he really blew me away. he's a big boy too, coming in at 9 1/2" tall. He's not hollow either, making him quite heavy and well built. The hands are sculpted in a general pose that will work pretty well with most stances, and they have plenty of detail as well. Frank breaks the streak - no bad paint work here. In fact, this is one of those excellent situations where the paint work improves and supports an already terrific sculpt. The cut lines are very clean, especially around the hair and eyes. The scars and tissue damage is enhanced with the paint, and the gray scale palette is used extremely well, with enough variation in the shades to keep the look interesting. The gray skin also makes the bright white eyes pop, much like it did in the old film. There's not a lot of articulation here - they claim 10 points - but he's not exactly a character that's going to be on Dancing with the Stars any time soon. The winner here is the fantastic ball jointed neck. With plenty of tilt and turn action and an almost completely hidden joint line, this one makes up for the stiffness in the rest of the body. There are basic pin/disc shoulders, which have a decent range of movement even under the tight coat. There's cut elbows, cut wrists and cut ankles as well, and the waist is another ball. This allows the torso to bend forward and back, or tilt to the sides, as well as turn. Again, that's not a ton of joints, but you can get key poses and the neck allows for lots of additional personality. My only real disappointment with this figure was the lack of accessories. I realize the Monster doesn't have as much that he could or should hold, but how about a daisy at least? 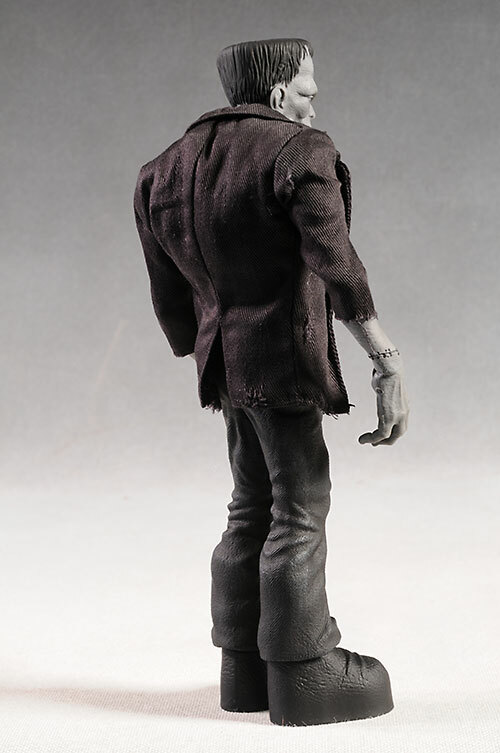 While most of this figure is sculpted, there's a very cool cloth shirt and jacket, which counts as a outfit in my book. The shirt is very tight fitting, and a tank top as well. It's fitted inside the waist, keeping it snug but making it a bit tougher to remove. I'd avoid it, although I'm sure not knowing what the scars look like underneath is probably killing you. Then there's the jacket, with weathering, rough edges, and another great tailoring job. Mixing soft goods with the plastic figure is a big plus for me, especially in this larger scale. The articulation is a bit restricting for true play, but for kids that love the classic monsters, this is going to be a hit. The stylized sculpt works for the under 15 set, and he's certainly sturdy enough for standard play. This special version cost a whopping $50, but even the regular non-exclusive figure is around $28. The extra bucks are due to the VERY limited nature, with only 100 of this paint scheme being released. When you get down to around the double digit edition size, you really are talking a true 'limited' edition, making the fifty dollar price tag a bit easier to swallow. I saw this guy several times at shows, but he never jumped out at me as exceptional. 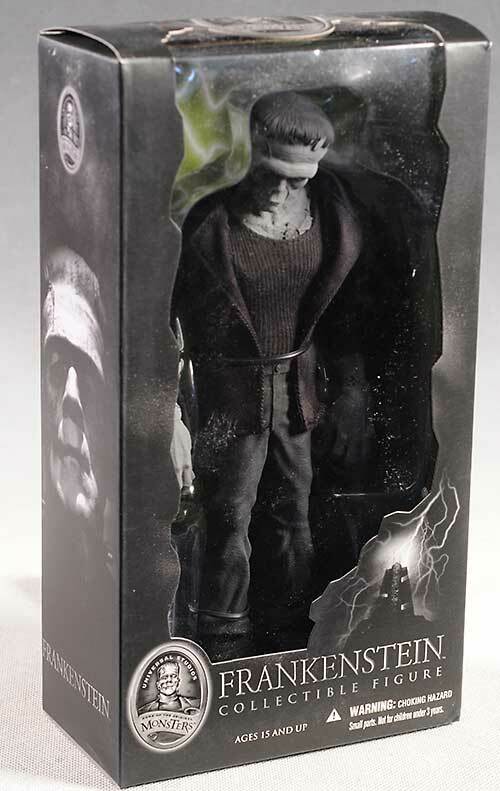 Cute, yes, and I knew I'd pick one up if for no other reason than my Universal Monster addiction. But in hand, this guy really impressed me. If I'm being completely honest, I suppose I should drop the Overall a half star, due to the lack of accessories and price point. But I just can't do it - he's just too cool. However, if the slightly cartoony look doesn't work for you, I understand. It can be a bit of an acquired taste, and it works better for some characters than others. I think it works great here, but of course your mileage may vary. - had the regular for $27, but appear to be sold out. - has the non-exclusive right now for $27. - has him at $28. - Entertainment Earth has him at $28. - the recent 1:1 scale bust. - the recent DST versions of Frank and his Bride. - Toy Island did a version a few years back. 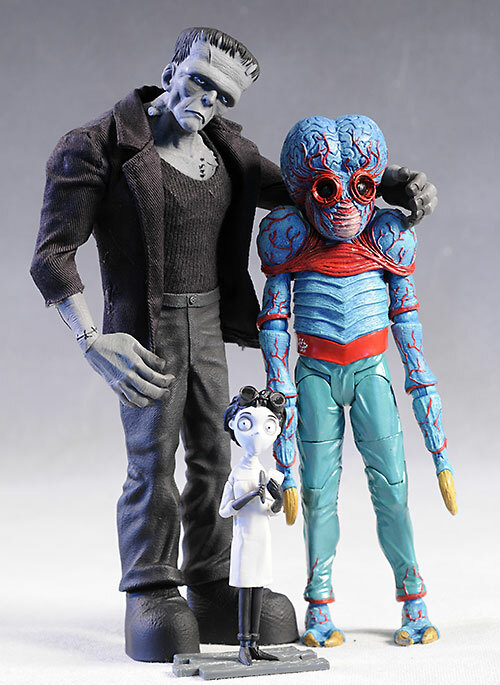 - in an 8" scale, Sideshow did a Son of Frankenstein, and there's a Little Big Head as well as a Little Big Head as a wrestler. 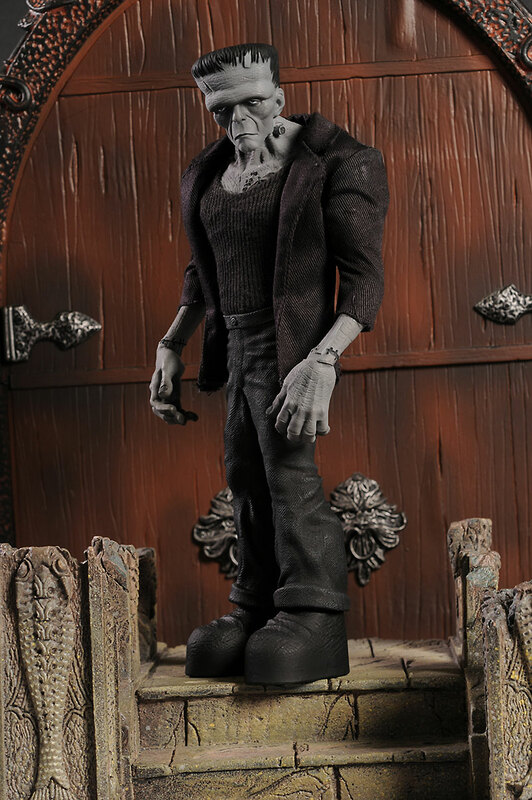 - Sideshow also did 12" versions of the original monster, several other actors as the monster, the Bride (and Frank from the same film), and one of my favorite sets, Young Frankenstein. 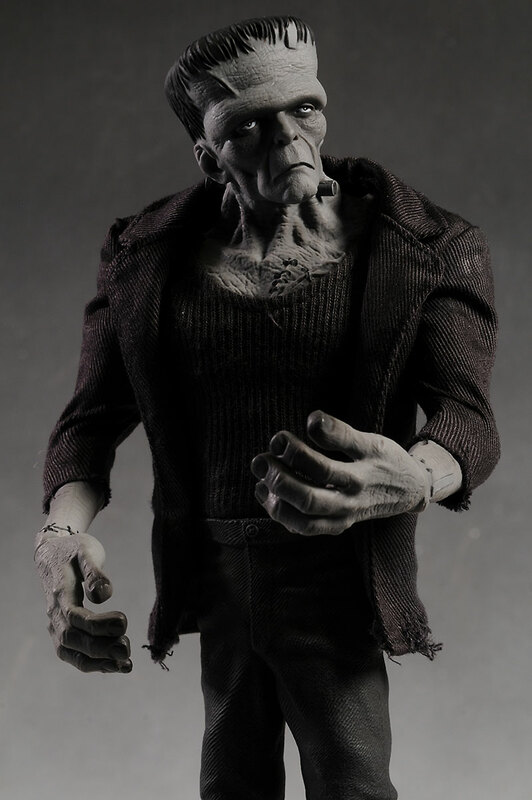 - McFarlane did their own take on the Monster, which is quite unique. 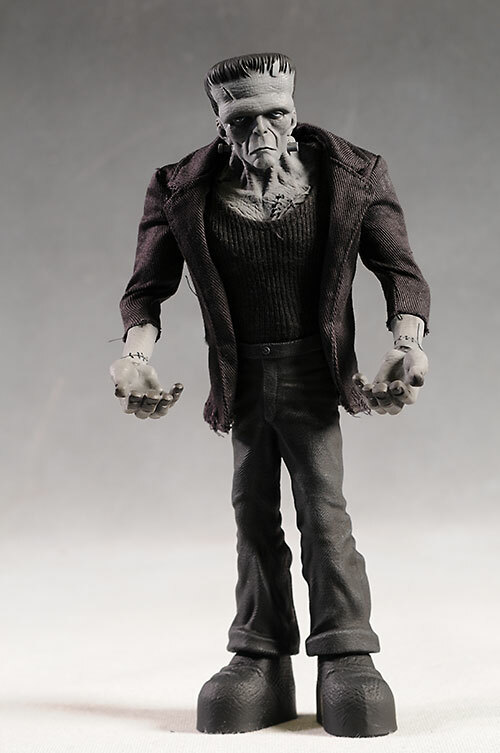 - and one of my favorites is the Premium Format version from Sideshow.